Learn how to tell the time in French & all the French expressions of time with clear explanations and audio recording. 1 – Telling the Time in French – Watch Out for The Liaisons! In French, when you tell the time, you always have to repeat the word “heure”. Since it starts with a silent H, you will have many liaisons and glidings. The word heure(s) is pronounced in the same breath as the number, as if it were a weird ending to it. So you see, the word heure becomes neur, zeur, treur, keur, teur with the liaisons and glidings. Note: in writing, the word “heure” is abbreviated as “h”, not the English “:”. We don’t write nor say the word “minute” when we say the time, but if you need to abbreviate the word minute, it would be “mn” in French. In French, all the official schedules (TV, radio, trains, planes etc…) use what you call “military time”. Based on a 24 hour clock, you say exactly the number of hour, then the number of minutes. Note that we don’t say “hundred” for a round hour like you do in English: in French, we just say the hour number. But don’t forget to say the word heure(s)! Il est treize heures quarante-cinq = it’s 13:45. Il est vingt heures = it’s 20:00. This pretty much works as in English. 1h45 = il est deux heures moins quinze or il est une heure quarante-cinq. No one would say il est une heure moins vingt-deux. When you need to be precise, use the minutes past the hour or the official time. And following the same logic, you cannot use minutes to the hour with the official time. Note that these 2 expressions do not require the word heure since their position in the day is self-implied. I strongly recommend that you use these, since douze heures sounds a lot like deux heures when you make the liaison. Otherwise, in official time midi is “douze heures” and minuit is “zéro heure” (no S at heure). 1h15 : il est une heure et quart. Note the difference between quart (pronounced car) et quatre (4). 3h45 : il est quatre heures moins le quart. Note: don’t forget to say the following hour : THREE forty five is quarter to FOUR. You also want to glide your “le” as much as possible – it almost disappears when we speak fast. 1h30: il est une heure et demie. Quelle heure est-il ? = what time is it? Auriez-vous l’heure, s’il vous plaît ? = would you tell me the time, please? C’est à quelle heure ? = at what time is it? Il est neuf heures pile, neuf heures précises = it’s nine sharp. Mon cours commence à la demie = my lesson starts at – whatever hour it is now – thirty. C’est ouvert de quelle heure à quelle heure ? = it’s open from what time to what time? Il arrive dans trois quarts d’heure = he’ll be there in 45 minutes. Ce magasin est ouvert 24 heures sur 24 = this shop is open all day and all night long. How Should I Tell the Time in French? So, which method should you use to tell the time in French? It’s really up to you. 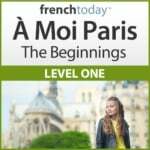 Pick one, stick to it when you speak, but you need to understand all of them so you understand the French when they speak to you!